Treat Your Feline Friend to a Long & Healthy Life! 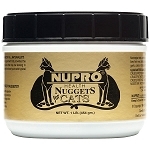 NUPRO® Health Nuggets for Cats is a superior supplement formulated to provide your cat with the raw vitamins, minerals, enzymes, amino acids and omega fatty acids that may be lacking in commercially processed cat foods. NUPRO® Health Nuggets for Cats is designed to boost your cat's typical diet using whole, fresh, nutrient-rich ingredients that are health store quality. Cats just love the "Crunch Factor" of the nuggets! They can be added to wet or dry food. If your cat prefers, the nuggets can be easily crushed and mixed with water or broth to make a delicious liver/fish gravy. If you would like more information or a Taste Sample of Nupro® Cat Nuggets please call 1-800-360-3300. Norwegian Kelp - A natural seaweed that grows deep in the ocean, mostly in cold waters, containing the purest of valuable nutrients from the ocean floor. Kelp is a rich source of trace minerals including iodine, necessary for proper glandular function and metabolism. A necessity for cats who eat grass - they need fresh, green, vegetable protein. Flaxseed - Provides essential omega fatty acids. Most absorbable vegetable fatty acid for the feline. Rich in omega 3 fatty acids, alpha-Linolenic acid, fiber and lignans. Helps maintain healthy, shiny fur and soft skin. Nutritional Yeast Cultures - Best source of B vitamins. Helps your cat to maintain silky, shiny fur and healthy skin which may minimize the occurrence of excessive shedding. Nutritional yeast cultures contain only vegetable properties; no grains. Desiccated Liver - Supplies iron, B vitamins and enzymes. Fish Meal - Cats love the taste of real fish! Another source of omega fatty acids and protein. Works well to balance the flax seed oils. Alfalfa - A rich source of chlorophyll, and Vitamins A and D.
Amino Acids & Enzymes - A wide array of naturally available amino acids and enzymes. Supports a healthy immune system. Garlic - Contains allicin, a powerful antioxidant, helpful in supporting healthy immune and cardiovascular systems. Lecithin - Essential for normal, healthy nerve and brain function. Lactobacillus Acidophilus - Supports healthy digestion. Promotes friendly bacteria in the intestinal tract. Please follow the chart below in choosing the size that’s right for your cat. Begin using NUPRO® at the dosage shown for two to three months, allowing it to detoxify and build a healthy immune system. Following the initial period, decrease NUPRO® dosage to one half and continue to use as part of your regular supplementation program. NUPRO® is recommended to be administered during or after your pet has eaten. Servings may be divided between AM and PM.